One of the many issues faced by shipping companies when making international payments is exchange rates. This becomes especially problematic when you are paying salaries internationally as the beneficiaries of these payments may be adversely impacted through no fault of their own. 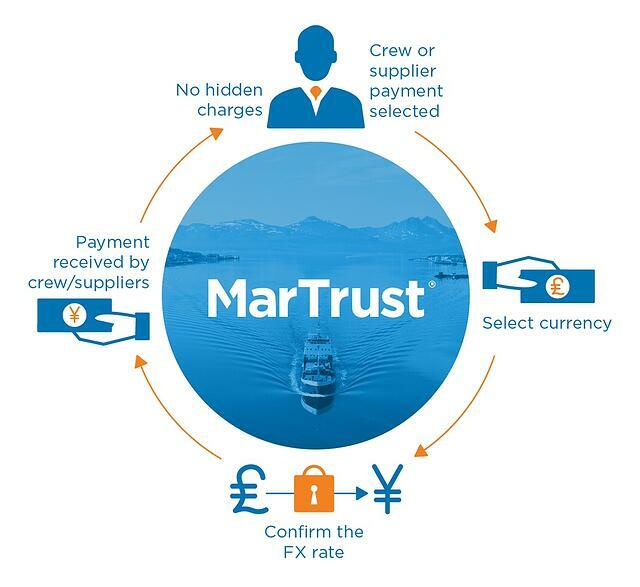 MarTrust works hard to offer payment services without unpleasant surprises for the seafarer you are paying, or for your HR team who are processing the payments. As a part of The Marcura Group, MarTrust puts a prime focus on transparency. As such, we disclose the applicable costs and exchange rates enabling you to have a clear accounting audit trail. Local ACH payments can be made in a wide range of currencies and this is the most reliable and cost-effective way to remit funds without any deduction. If ACH payments are not an option, for example, if you are required to make a payment in an 'exotic' currency, then you can choose wire transfer payment. With this option, a flat fee is added to your payment which covers any intermediary and banking fees, which otherwise would be deducted from the payment. From talking to our customers and from our own canvassing of the market, we know that we are very competitive, offering some of the most cost-effective rates in the market. With no hidden fees, you’ll always know the total cost upfront and, before committing to the payment instruction. This way you can also guarantee full payment to you crew. Once the received funds are reconciled, the payment gets dispatched and efficiently delivered. You can then inform the beneficiary that they can expect to receive payment. We consider all payments as high priority, and act accordingly. We have a 99.9% accuracy on payment delivery, compared to the banks’ 94%. Our maritime customers perform secure transactions at low cost and pay their suppliers and their crew around the globe in over 130 currencies. As a MarTrust customer, you are supported with transparent, competitive FX rates and safeguarded by a strict compliance scheme. We tailor our services to the customer’s requirements and are happy to benchmark FX rates and transfer costs. Our growing customer base confirms that we are able to offer effective service and efficiency levels. Thankfully, this has not come as a surprise to us.